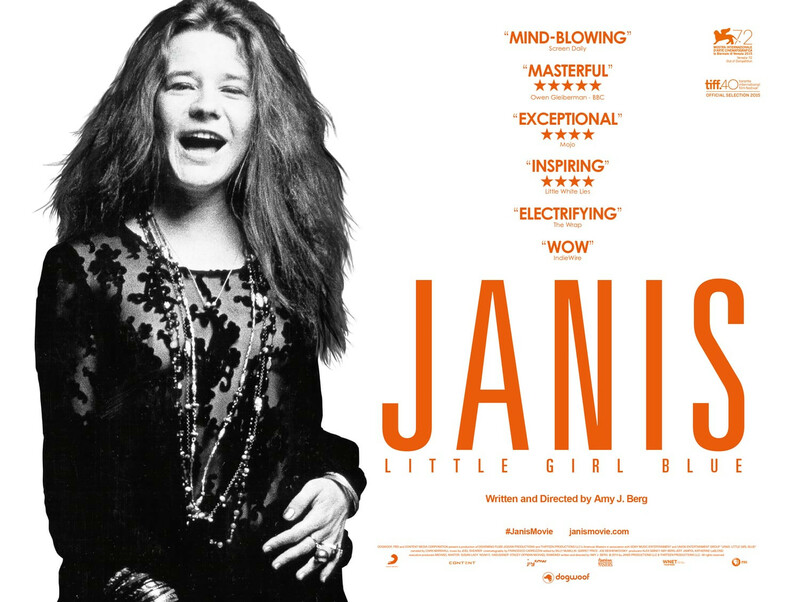 Another recent PBS highlight was the airing of Janis: Little Girl Blue, which I had missed during its theatrical release a few months back. I love good PBS programming, and American Masters is continually excellent, but it would be nice if they wouldn’t claim films as their own original production without a nod to prior release; this is not the first time they’ve done that. WHEN JANIS SINGS, I’M GLUED. At the program’s start, I said ‘ho-hum, I’ll flip between this and baseball.’ That flip never happened, and baseball took a night off. This documentary ended up being one of the most magnificently compelling musical biographies I’ve seen — in a sense, much deeper than Amy. It features a ton of never seen before footage (by me anyway). Janis Joplin was a joyously, deeply talented performer, heralded in her lifetime as “Queen of the Blues.” Little Girl Blue does a good job sticking to her life story, which is all that needs to be done. 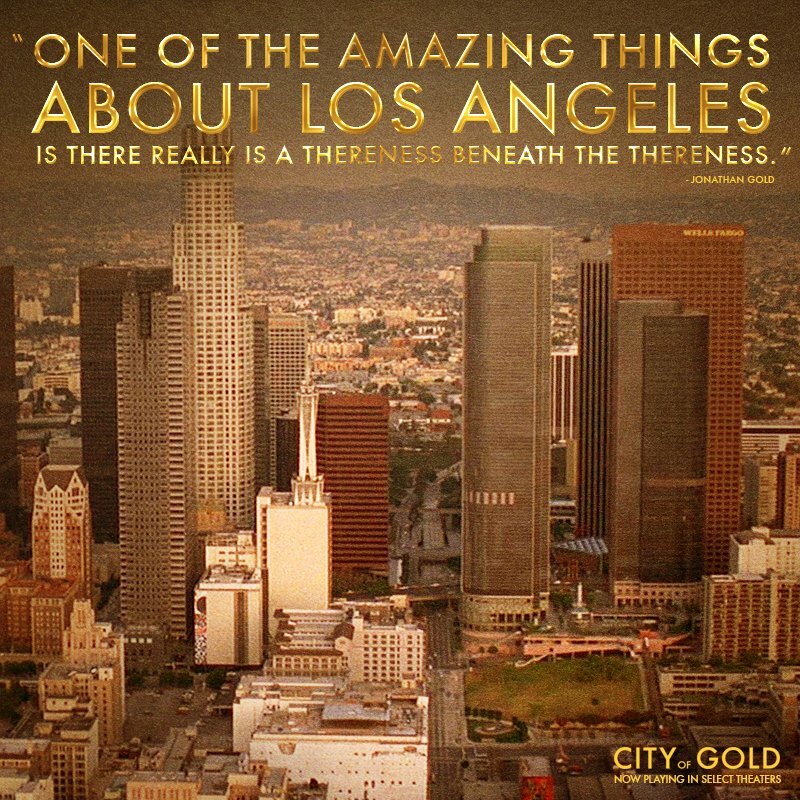 It’s a testament to his (Jonathan Gold’s) prowess that the voice-overs of his writing are riveting; you may want to stop watching and just go read everything in his Los Angeles Times author archive. …While the film’s formula gets repetitive, little revelations peppered throughout keep it engaging. Gold’s the unlikely hero with the golden palate, but his work also involves obsessive scholarship and research, and if you don’t know about his background, surprises await. AGAIN THIS YEAR AS LAST, our local PBS station emerged from an endless tedium of run-on pledge breaks almost as if it had something to prove. It’s very frustrating to me that PBS completely discards all normal programming in order to convince you to support the type of programming that only occurs during pledge breaks. Great thinking there, KPBS. If they found a way of soliciting contributions commensurate with the level of programming I highlight today, I’d return to membership. 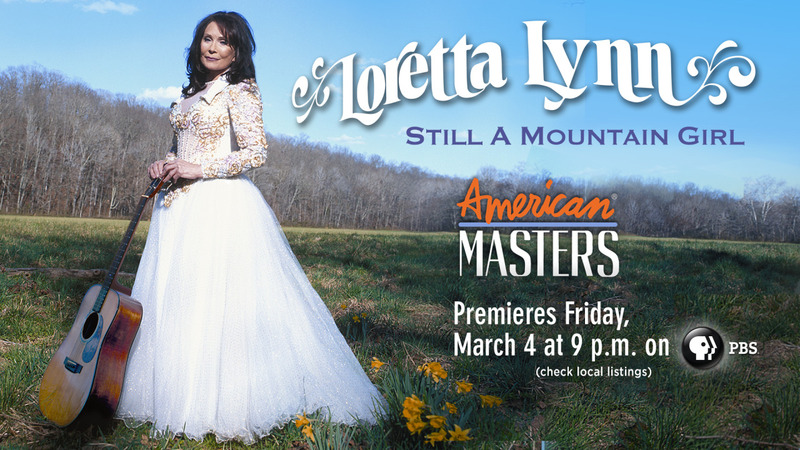 So first up, premiering locally on Tuesday, March 29, (March 4th I imagine they were too busy with the month-long pledge break) was a two-hour American Masters biography of Loretta Lynn. I learned a lot about her life and music, having for so many years eschewed country music. I still think that most modern mainstream country music is like most popular rap: not worth listening to. But Loretta Lynn: now there’s talent. I was completely enveloped by this biography, and just as I felt it drag slightly in the second hour it swept me right back in with her more recent work, including collaborations with the likes of great rock star Jack White. I think that’s the mark of an enduring icon: like Johnny Cash, David Bowie, or Leonard Cohen, continuing to produce ever-more profound work right to the end (not that Loretta Lynn is by any means at the end). That first line of “Portland, Oregon” gives me goose bumps. What an eternal voice. 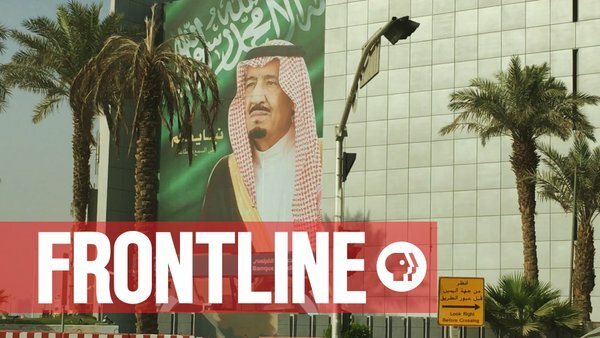 KPBS followed up the Loretta Lynn show with a jarringly different Frontline, “Saudi Arabia Uncovered.” It’s quite clear that Saudi Arabia is a completely corrupt, morally bankrupt nation governed by those who so lack confidence in their faith that they disallow any sort of non state-sponsored journalism, women from driving, or non-Muslims from entering the city limits of Mecca, as just a few examples. You’re talking about a country — typical for the region — that is maybe one step above Syria, Afghanistan or North Korea. A country that makes China look like a thriving democratic fun-zone by comparison. This episode of Frontline was as compelling as any of this gem of broadcast journalism. It and American Masters are available to watch online or via your streaming device. The dead singer, not the movie about her. If I were judging Amy purely on filmmaking skills, it would receive a thumbs-down. Case in point. I heard Tony Bennett’s posthumous compliment of her about being that rare “true Jazz singer.” So it’s appropriate that the movie use this quote. What’s inappropriate is repeating the quote three times. That gets uncomfortable, because it uncovers the movie’s greatest fault: disorganization, and by extension lack of vision. Amy did that a few times — repeated itself unnecessarily, as if the filmmakers weren’t confident they were getting their point across. Repetition in film can be a very effective narrative device if done tactfully. 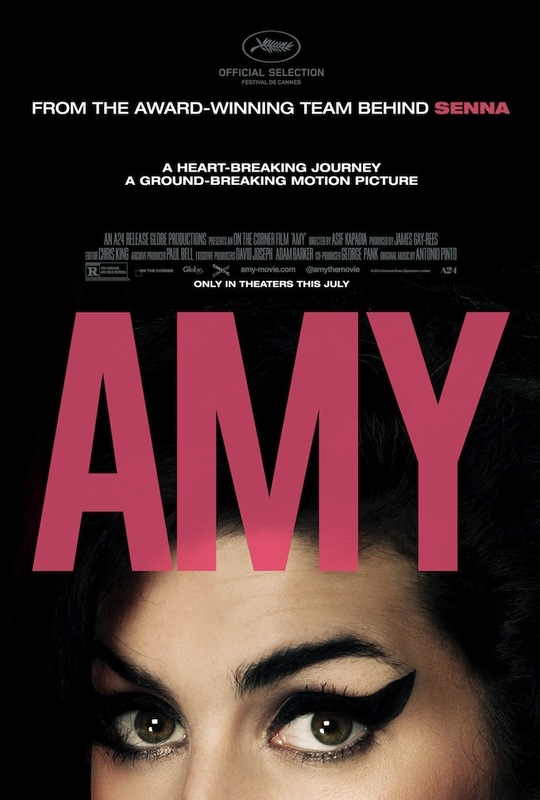 Tact is what Amy — the movie — lacks. I think the reason for Amy’s faults is that the filmmakers were so absorbed with all the material in front of them that they got swallowed up by it. Without knowing what to leave out, they threw everything in, sometimes multiple times. But I admit, I got swallowed up myself. There’s no doubt that Amy Winehouse was a great singer, a great talent, a young woman full of soul and passion. Amy did not open up any sort of deep, profound revelation that we’ve never heard before. The job of a documentary like this is to provide that ‘ah-ha’ moment — and it failed at that. Which is connected to another shortcoming of the film. There was little trajectory, or arc of story — doom was written all over Amy Winehouse from the beginning. One could argue it was impossible to show a trajectory that didn’t exist in the person, so in that sense Amy may be forgiven. A couple more dings: the movie hails itself as “a ground-breaking motion picture.” No way on that one. And on Amy Winehouse herself — yes it’s a tragic story. I can grant that. But don’t compare what happened with her to the truly tragic ending faced by, say, John Lennon. Amy is effective, but for an infinitely more emotional and powerful experience (and a vastly better film), go with Life Itself. As unconventional and unwieldy as the life and legacy it honors, Love & Mercy should prove moving for Brian Wilson fans while still satisfying neophytes. True, except the part about neophytes. As ubiquitous as Beach Boys music has been in the past, if you don’t have a general familiarity with the band don’t expect to find it here. 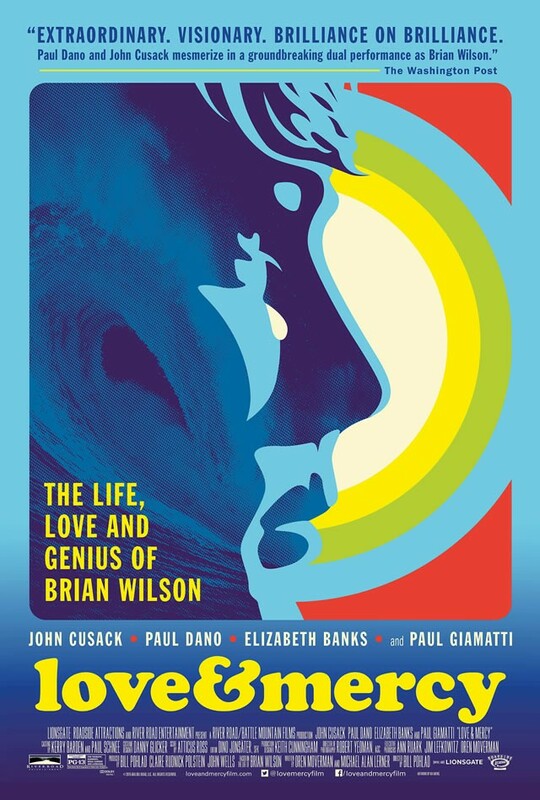 Love & Mercy focuses on the life of Brian Wilson in the latter stages of his involvement with the Beach Boys, and on a sour period years after departing it. The obvious comparison brought to my mind was Shine. Not showing the Beach Boys’ rise to fame is one of the ‘unconventional’ choices the film makes, and there are others. 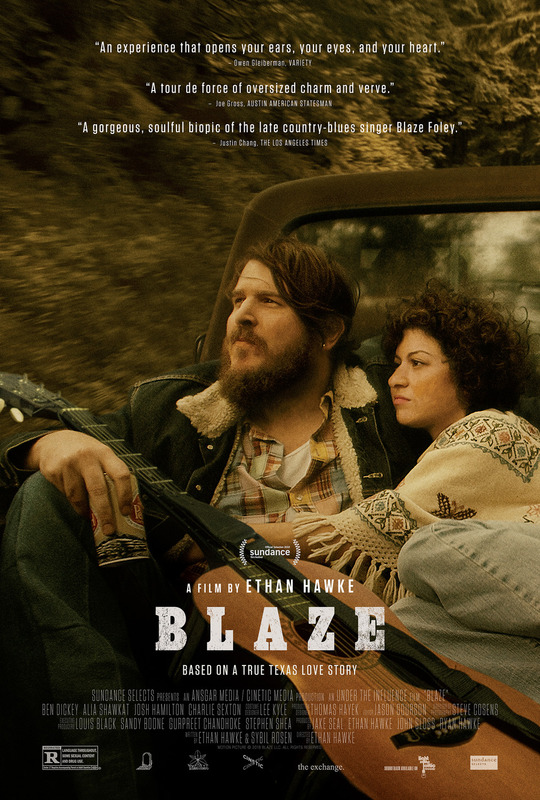 A Note on the actors: Kudos to Elizabeth Banks on a job well done here. I became enamored of Banks with her supporting but pivotal role in the exceptionally underrated psychological drama The Uninvited. And if I don’t get around to a separate post, 2015 will forever be known as the year of Paul Giamatti. I caught a good chunk of Don’t Stop Believin’: Everyman’s Journey a while back — I can’t remember on what channel — and was reminded of what a terrific story it is last night as it aired on the PBS series Independent Lens. Though I have not seen the film all the way through, I recommend it. And if you’re a Journey fan, it’s a no-brainer. 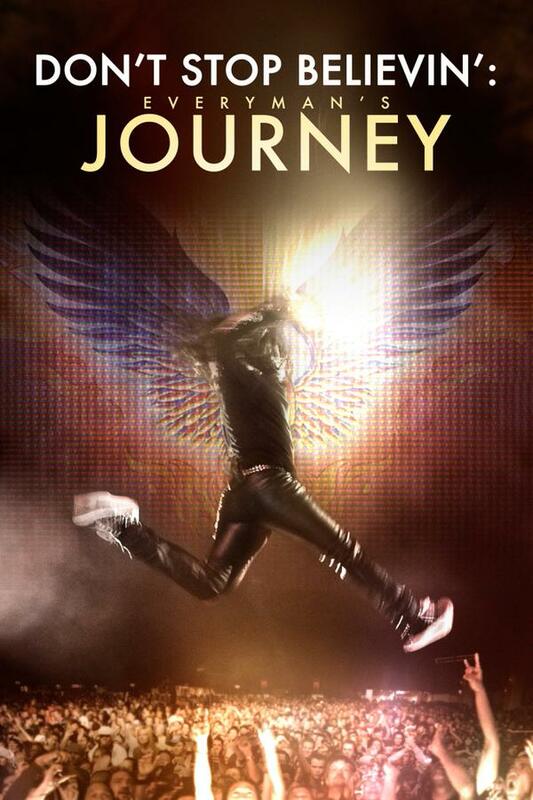 The story of the band’s new frontman Arnel Pineda is fascinating, inspiring and heart-warming. What enriches the story so much is that Pineda is such a nice guy, humble in his extraordinary talent. Catch it if you can.